This page is a continuation of my introduction because it explains in more detail my nostalgic attachment to cane mills. 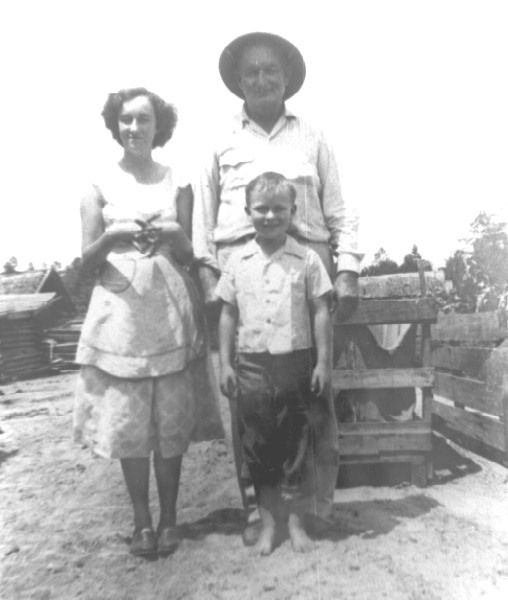 It all started with my maternal grandfather, Mark A. Watson, who was a syrup maker. Grandpa was a lovely man, far kinder than his time and circumstances would have suggested. 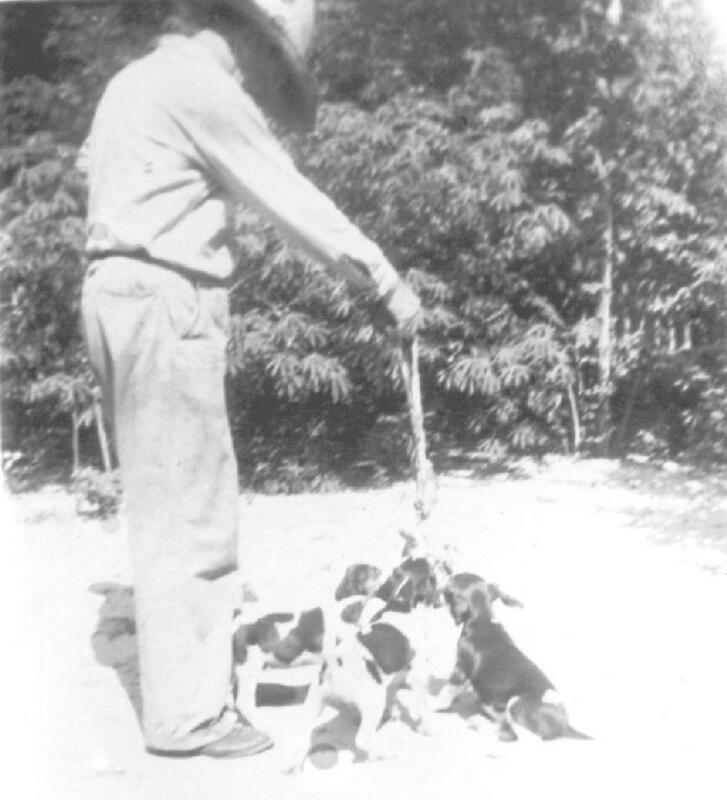 Although exercising dominion over beasts was part and parcel of his culture and livelihood, he had a special relationship with and respect for animals as indicated by this photograph from the 1930s (Slide 1). As an undisciplined youngster, I sought amusement from animals, but Grandpa’s disapproval was enough to cause me to stop dropping out of pecan trees onto the backs of unsuspecting cows or using birds for target practice. Grandpa didn’t have much use for bossing in either direction, which suited me fine and provided me some relief from my grandmother, who was opposite in every way. He said what was necessary, which was usually not too much; in fact, it could be very little indeed under circumstances that need not be described here. In a way, I felt that my older sisters were luckier than I was because they were born in Grandpa’s house, as was my mother, and lived on the farm, which was less than one-half mile from Grandpa’s. When this photograph (Slide 2) was made in 1942, they were the only grandchildren. Della Faye (Slide 2) died suddenly (obituary , photograph) within the year, leaving Carolyn as the only grandchild, except for an infant cousin. The upper left in this photograph shows the edge of the Sugar Mill Yard, about which more later. (The buildings in the upper right were remodeled and combined before the aerial view below was taken.) Note the grass-free yard; any plant in the yard was a weed. The stated reason was to keep snakes away, but this custom must have deep cultural roots, like burning leaves in the fall. Though not to the precision of a Japanese garden, it was an almost weekly task to sweep the yard with a broom made of gallberry, better loved by me because it is a honey plant. One notes also the paling fence, which surrounded country homes to keep domestic animals out. Some years later, I was born and Grandpa’s house became my secondary and sometime primary residence. One of my favorite photographs (Slide 3) shows my sister, my grandfather and me when the world was my playground. Because of his debilitating arthritis, I was of use to Grandpa and he had time for me. I don’t think he ever said an unkind word to me, which is in marked contrast to the behavior of many adults then toward children or anyone they deemed inferior for some reason. I suffered my first setback at age 13 on October 2, 1959, when he died. I took to the woods, as he probably would have done if the situation had been reversed. My grandfather inherited two joining farms from his father, Sam Watson. Grandpa Sam purchased the farms from Steve Lewis in 1905 or 06. My father’s maternal grandfather (which is as much to say, Jerry "Buck" Sutton) had purchased the farm to the east from Mr. Lewis in 1878, and Aunt Lena inherited the farm to the south from Mr. Lewis, her maternal grandfather. One farm (Slide 4) was “built up” and was the site of the home, a smoke house, an ice house, a wash shelter (well, wash pots for rendering fat, &c.), a large cow barn, a mule barn, two corn houses, two pack houses (for tobacco then, but for cotton earlier), a goat shelter, chicken houses, and, of course, a sugar-mill yard. 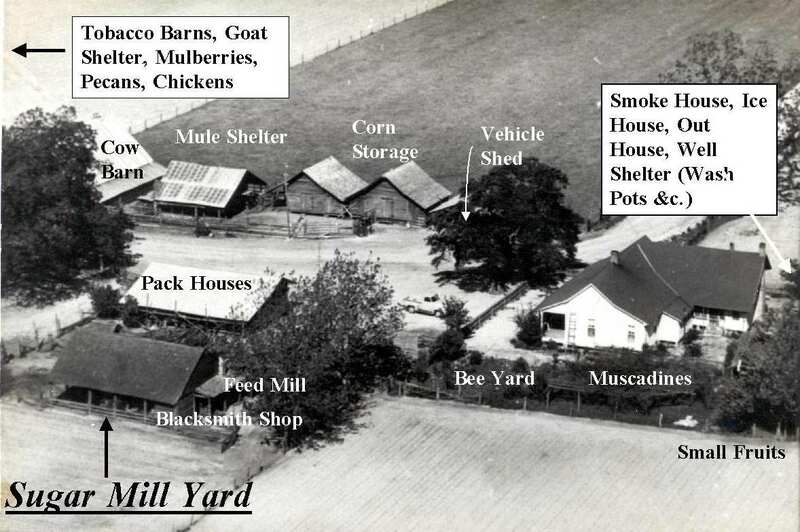 The sugar-mill yard was covered with an open shelter, with the mill in the center and the kettle and furnace on one side. A blacksmith shop and a feed mill shared the shelter with the cane mill and the kettle. In Grandpa's later years, the blacksmith shop was barely used; it became a storage room for cans of syrup. These syrup cans could be had for $3.75 per 50 from Ward's in 1936, the last year my mother lived at home. The syrup cans were recycled, of course, and found such uses as being lunch pails for the school children at Deep Ditch and as a container for miscellaneous items that were not worth saving. 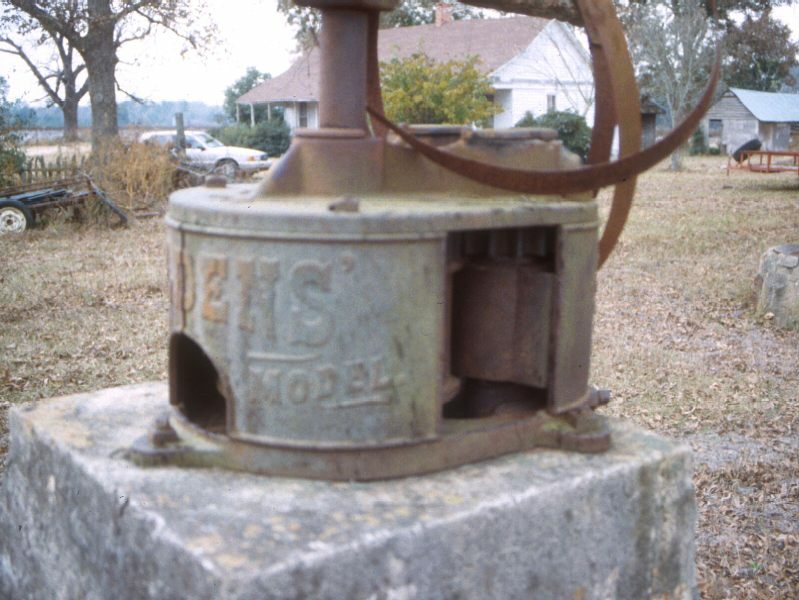 During my childhood, the sugar-mill yard was filled with family twice each year-for syrup making and for hog killing (the syrup kettle doubled as a scalding pot for hogs in preparation for removing the hair). I was born on a wave of change; the Great Generation had just saved the world from insatiable imperialism, unbridled racism, and nationalism run amok. Ten years earlier in the rural South, mule power, extended families, outhouses, and the lack of electricity had been the norm during a depression that worked with money-lenders to tear land from the yeomanry. Ten years later, TVs, automobiles and tractors, were all in the hands of prosperous land-owning farmers, although the lower economic classes, the tenant farmers and, worse, the day laborers did not share in the new-found wealth. . . . and many younger people had quietly left the countryside to find opportunities in distant cities. Although this demographic shift occurred in most families, including my father’s, all of my Grandfather Watson’s family remained nearby except, of course, during the war. Syrup making was not immune to the change. In my childhood, it was a family tradition, as described above, but earlier, syrup had been produced as a source of income, and I beg leave to describe what I have been told about my grandfather’s syrup operation in the 1930s. 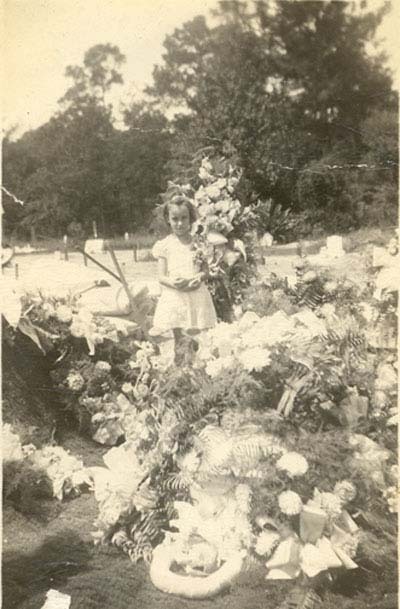 This was a time, generally, when small farmers were lucky to hold onto their land, when children were excited to receive a few pieces of fruit for Christmas, admission to the local theatre could be paid in eggs, and when my grandmother baked sweets for sale at the “curb market,” just off the square in Nashville. Darkness was lifted from the sugar-mill yard when a burly gentleman, Hamp Harrison of Quitman, GA, installed a Delco plant about 1933. This electrical plant consisted of 16 rectangular glass batteries and a generator that was fed five gallons of gasoline each Saturday morning. 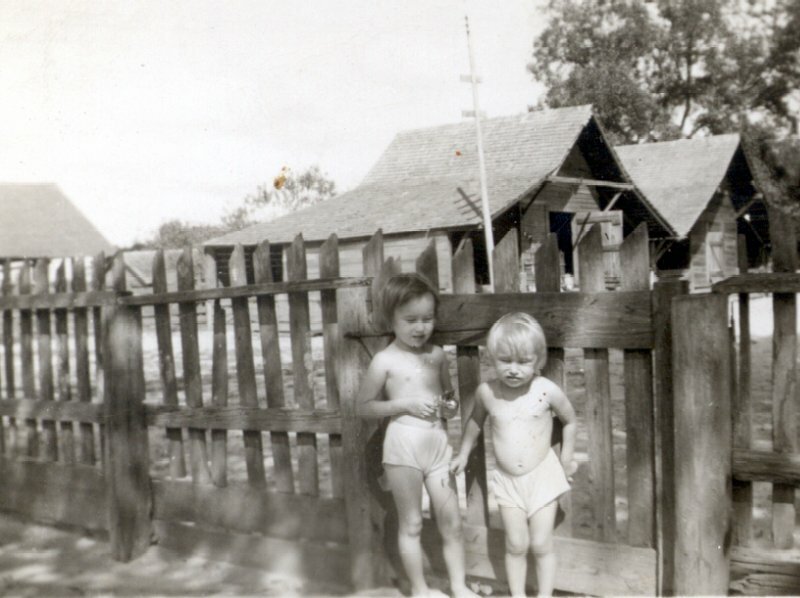 (The pole behind Carolyn and Della Faye (Slide 2) distributed power to all the outbuildings.) With protection by the shelter and illumination, syrup could be made continuously over six long days each week. Therefore, for a month each fall, the kettle boiled, making up to 5 kettles per day. This will seem like a lot to present-day syrup makers who do not have a barrel of juice before daybreak and who quit before 10 pm. It is true, however, because both my uncles, Sam and Herbert, told me so and neither would go to the trouble to lie. The syrup was made for family use, to sell, and to trade to Levin’s traveling grocery truck. But, the operation was more than all that; it was a community affair. Mr. Ab May then lived on the farm to the west (which belonged to my grandfather’s sister, being inherited from Grandpa Sam). Mr. Jim Warren lived on the next farm. Mr. May and Mr. Warren and their families joined in, bringing their cane, so the mill was a community center for a month and visitors from nearby Nashville were regular. It is my understanding that my grandfather enjoyed the camaraderie with them, but was less encouraging to others who did not take care with the equipment or hygiene. He knew how he wanted things taken care of, and I understand that more than most will know. I figure I take about as good care of his 1956 Ford 640 as he did. As a matter of information, at about this same time, Earl Carter had a pretty good-sized sugarcane syrup operation about 100 miles to the northwest. For a view of a larger syrup-making operation in those times, see the autobiography of his son (Carter J (2001) An hour before Daylight. Simon & Schuster, New York). Pictures above (Slide 5 & Slide 6) are of the mill, a Golden New Model # 2. This mill is one of the earliest New Models-it has a small plate attached to the top plate indicating that the patent was applied for. This would place its manufacture about 1904-1906 and most likely, the latter part of 1905. (Thanks to Ken for the details of the patents covering that mill.) 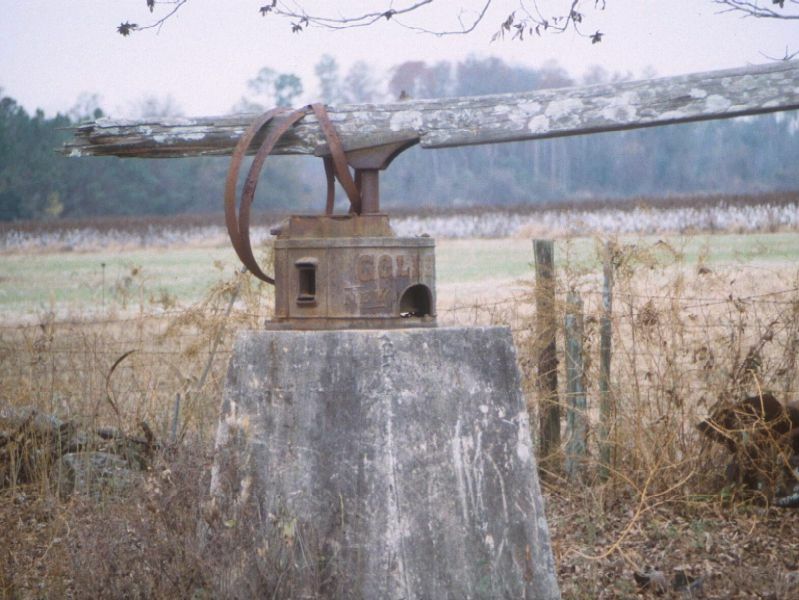 No one remembers when the sugar-mill yard was built. My late mother, who was born in 1918, said that the mill had “always” been there. It seems likely that Grandpa Sam built it right after he bought the place. It would have taken a bit of capitol to buy the three farms and especially to construct the buildings. Earlier, the Watsons had owned land to the east and perhaps its sale provided currency. In any case, the Watsons were pretty well established in that part of the county, having arrived about 1813. The concrete support for the mill was built about 1930, which my uncle Sam can barely remember, but there is no information about the predecessor structure. In general, however, cypress was used for building posts. Also, note that the sweep was mounted horizontally and adapted to an angled sweep lever (which was the default supplied with this mill). The sweep itself was made of an L-shaped cypress log. This arrangement permitted one to work more easily around the mill as Cora, the last mule, circled endlessly. It is entirely possible that the real reason to put these pages up is to remember Cora, old Cora with her soulful eyes, calculated moves, and stoic demeanor. According to my uncle Sam, Cora came to the farm in either 1923 or 1924. Cora worked hard and trained another mule to work by coupling to a double tree. In my youth, John Deere had marginalized her. I do not remember that she worked so much, but she still had to be fed and watered. As a practical man who raised a family during the depression, who had weathered the loss of a tobacco crop (the only cash crop) due to a late freeze, who had seen his hogs wasted by cholera, Grandpa sold Cora for glue in about 1955, and meaning no disrespect, I am glad he was never paid. Loving animals more than being practical, this sale is still an issue with me. Cora's barn was jacked up to accommodate one of the first, if not the first, combination corn picker/shellers in the area. Then, the barn fell. Now, there is no trace, except for Cora's well, which being mine now is under no threat and stands as her monument. 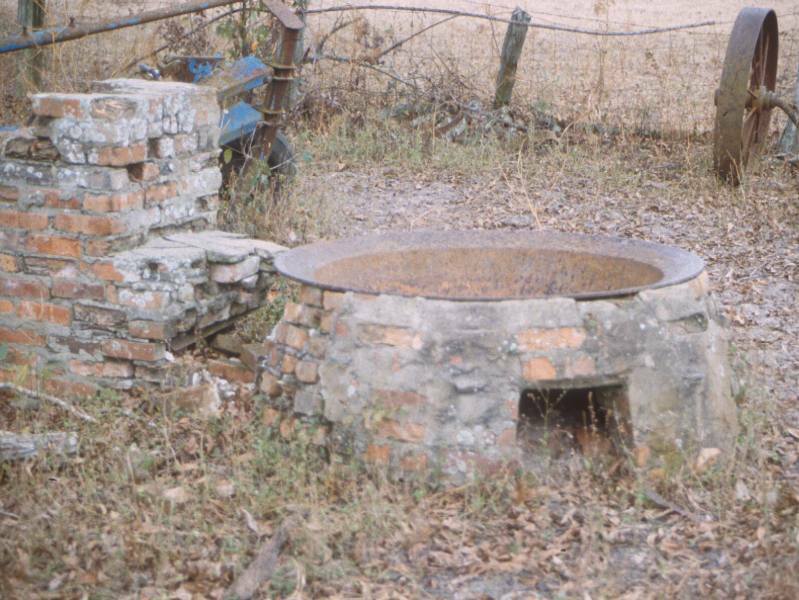 Slide 7 shows the kettle and what is left of the wood furnace. Sadly, the memories are even more fragile than the bricks. After the cane, the syrup, and the juice, the pomace (bagasse) still had to be dealt with. (Pomace, incidentally, came into English in the 1700s from French (pomme = apple) and originally from Latin. At first, it meant the apple residue after cider had been pressed, but was soon adapted to mean many kinds of pulp, even fish pulp. Many variant spelling are used (pommey, pummy, pummyse, pommice, and probably several others that the Oxford English Dictionary compilers don’t know about.) In one or another place, pomace is used for fodder, fuel and fiber. As did others, my Grandfather placed it in the cow barn, where it provided bedding. Over winter, it degraded. But, to give you a contrast with the high-falutin etymology above, I will get down to the nitty-gritty of pomace disposal. In short, it became a personal affair, because whatever it degrades into was mixed in with whatever cow manure degrades into, which in sum is fertilizer and not to be wasted. During the winds of March, the floor of the cow barn was cleaned out and the fertilizer was put on a wagon and taken to the field, which was all easy enough. Unfortunately, though, my grandfather did not have a fertilizer distributor; he had several, including me. We fashioned large aprons from burlap with holes cut for our head and arms; the backs of the apron were pinned with nails. With each of the front corners pulled up by the respective hand, a nice large fertilizer pouch was formed. With the pouch full, we walked down the opened row sifting fertilizer into the furrow. When the tug of the good old days seems more than I can bear, I just imagine a day of distributing fertilizer, dusty fertilizer in the wind, with all the moist epithelial junctions caked and I pull back to the twenty-first century with a smile.